The apartment which is located in an interesting semi-circular residential building has been renovated in such a fashion that it brings joy to a senior couple. The interior is thus conservative, but warm. It was designed with easy maintenance in mind along with having enough room for a collection of books, souvenirs from various trips and room plants. The apartment was built for living in the 30’s of the 20th century. The dark vestibule once divided the apartment. 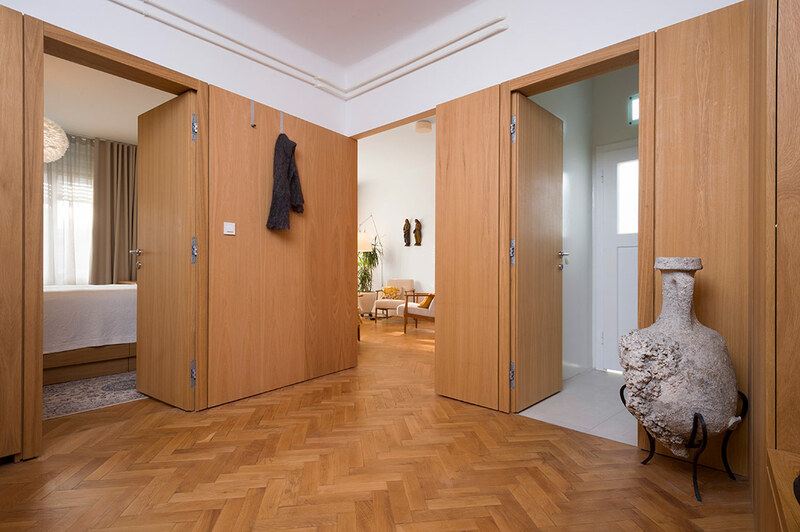 After removing the partition walls it became a bright and clear area which connected the rooms of the apartment. The cabinets, doors, radiators and even the door phone are all hidden behind a natural oil finished oak lining covering the walls. 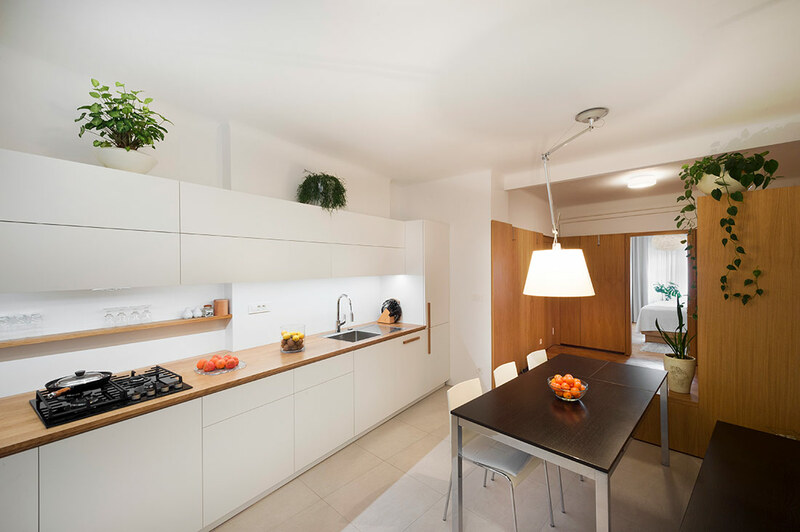 Through this room you enter the two most important areas of the apartment – the living room and the kitchen with the dining area. The former wall that divided the vestibule and the kitchen has now been replaced by a bench which became a popular newspaper reading area. A special challenge was solving all the details due to the uneven semi-circular design of the building where not a single wall was parallel to the other. The intend was to make the details minimalistic and “invisible”. The built-in furnishings are all in the same height as the door headers, contributing to a feeling of spaciousness. The clear design of the built-in furnishing is complemented with older pieces of furniture to which the owners have fond memories to. Even in the design process the layout of the antique wall clock, the Roman amphora, the wooden rose window from the birth house which became a nightstand with a sewing machine on top of it, or the wooden old pieces of art on the brightest part of the wall were all carefully planned.